What Would Jessica Fletcher Tweet? The preternaturally smart heroine of Angela Lansbury's Murder, She Wrote sets a positive example for how writers have to promote themselves in our Twitter-centric world. In recent times, Jessica Fletcher has been a trending topic. To be precise, it’s Mrs. Fletcher’s alter-ego, Angela Lansbury, who’s been turning up in my newsfeed all year. It was Lansbury who became a British Dame, Lansbury who reprised her stage role in Blithe Spirit, and Lansbury who received an Academy Award for her seven-decade film career. But when Kevin Spacey announced the honorary Oscars in the spring of 2013, I felt he was recognizing Lansbury as a writer because her most famous role, of course, is that of mystery writer and amateur detective, Jessica “J.B.” Fletcher, in the popular television show, Murder, She Wrote. To become a published author in our millennium, it's not enough to craft a story worth reading. Finding an audience for that story seems to require an up-to-the-minute awareness, a mainline to the zeitgeist, an audible voice in a conversation that is not taking place in my suburban neighborhood. The conversation may be happening on college campuses, at hip workplaces, at a bar somewhere in Brooklyn. Most of all, it is happening on Twitter. Consider the sparrow: It twitters and tweets without urgency. It does not retweet or use hashtags to acquire followers -- yet it thrives. Now consider the author. She is a caged bird compelled to sing, an endangered species, tweeting to save her life. Or so you might conclude from the plethora of advice for would-be warbling writers. Twitter may be old news, but it’s still a hot topic among writers who are perplexed by the medium. Writing conferences offer workshops with titles like "I’m on Twitter, Now What?" and "How Twitter Works (and Doesn’t Work) for Writers". Recent months have seen a crop of how-to-tweet books for writers, like Beth Barany’s Twitter for Authors, Sonja Hegman’s Moving at the Speed of Twitter, and Lynn Serafinn’s Tweet-E-Licious: 158 Twitter Tips & Strategies for Writers, Social Entrepreneurs & Changemakers Who Want to Market Their Business Ethically (the title of which is nearly too long to tweet). Articles about twittering authors have appeared in The New York Times, The New Yorker, Poets & Writers, The Writer, Writer’s Digest, and numerous other publications. If you are an unpublished author, you’ve likely heard that you must build a platform before you can sell a book. You might, in Franzen’s words, long “to communicate in depth, individual to individual, in the quiet and permanence of the printed word,” but you can’t see how to accomplish that without first becoming one of the “yakkers and tweeters and braggers” who flourish in our digital age. Which is exactly what I’m afraid of. My Twitter feed, with its decontextualized blasts of content, feels to me like a cafeteria where I can’t find a seat. I carry my tray from table to table, working up the nerve to squeeze in somewhere and say, “Hey guys, what are you talking about?” Without mastering Twitter, I fear, a no-name writer like me will have no place at the table. But what if you’re somewhere between Franzen and me? What if you’re a mystery writer with a series of books in print? What if, although you’re more tech savvy than your contemporaries, you’d have little time to tweet between manuscript deadlines and weekly stints as an amateur sleuth? In other words, what if you’re Jessica Fletcher? I’ve become preoccupied with the question of whether Jessica Fletcher would tweet since I started watching Murder, She Wrote reruns on the Hallmark Channel last year. If you are concerned about finding your way as a writer in a rapid-fire digital landscape, identification with Jessica Fletcher is reassuring. She is simultaneously connected and calm, plugged in and personable, decisive and down to earth. She is safety and certainty in a world that is uncertain. In our True Detective era, it’s tempting to dismiss Murder, She Wrote as a relic of a less sophisticated time. But even when the series debuted in 1984, critics were surprised that audiences wanted a lollipop. Other popular programs that year were less saccharine: Cagney & Lacey, The A-Team, Dallas, Dynasty, and Hill Street Blues. Against these harder-edged shows, Murder, She Wrote was considered a long shot, but it became one of television’s most popular series. It ranked among the ten highest rated shows for eight of its 12 seasons and only fell below #15 in its final year, when CBS moved it to Thursday night, opposite NBC’s Friends. Indeed. Jessica Fletcher is like Nancy Drew with an AARP card. Like Nancy, she is capable of anything. In the first season of Murder, She Wrote alone, Jessica Fletcher fills a congressional seat, helps a pair of Russian ballet dancers defect to the United States, co-owns a football team (in an episode where Bruce Jenner's character is arrested for murder), and lectures at a university. And she doesn’t shy away from new technology. As the series progresses, she makes the transition from rotary phone to cordless and from typewriter to computer. Jessica Fletcher had a computer in her home in 1991, a year before my parents bought our family’s first PC. There’s little doubt that Jessica Fletcher is savvy enough to tweet. But would she? That question was still nagging at me when I attended a Twitter workshop led by Kelsye Nelson, cofounder of a business called Writer.ly that connects writers with publishing professionals. Nelson described Twitter as a civilized world where the golden rule prevails: If you want people to follow you, you have to follow them. She explained how a well-designed profile appeals to followers. She demonstrated how to use hashtags and lists to find and follow likeminded Twitter users. So far, so good. But then Nelson talked about a service called Tweepi used for managing Twitter followers. With Tweepi, I could follow whole lists of people with a single click. Hundreds of people. More people than I could possibly engage with. Nelson recommended at least 2,000 followers for a strong social media presence and 3,000 to start driving book sales. In order to achieve the ideal one-to-one ratio between people I follow and people who follow me, I could also use Tweepi to unfollow hundreds of people at once. The idea is to unfollow anyone who doesn’t follow me. Dump them, Nelson advised. Flush them from my account. At this point I wrote in my spiral bound notebook, “J.B. Fletcher would never be so mercenary!” If Jessica Fletcher used Twitter, wouldn’t she be more interested in communication than promotion? She’s the kind of author who writes personalized messages at book signings and makes time to help aspiring writers with their careers, not to mention clearing them of murder raps. She is a devoted sister and aunt (anyone else would have given up on Jessica’s hapless nephew Grady years ago) who stays in contact with friends from around the world. She would never let online activity replace face-to-face interaction, especially given her seemingly limitless travel budget. Maybe she would simply forego Twitter. I found solace in that notion as I left the workshop. If Jessica Fletcher could thrive in the 21st century without a Twitter presence, I reasoned, perhaps I could, too. But even as a daydream, this rationale wasn’t convincing for long. Jessica Fletcher is cheerfully pragmatic about technology. 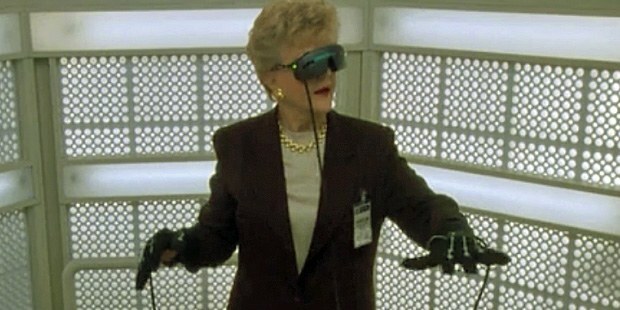 She donned a virtual reality headset in 1993 to script a murder mystery video game. If Twitter could serve a purpose in her professional life, she would tweet. J.B. Fletcher, an established writer who is decades older than me even in reruns, would not so readily dismiss Twitter, and neither can I.
Twitter serves many purposes for writers. Aside from promotion, New York Times essay titled, "Why Authors Tweet" (by Anne Trubek, again) offers: interaction with readers, interaction with other writers, collaboration, and experimentation with the 140-character genre. But from the perspective of someone whose Twitter presence is barely beyond the hatchling stage, tweeting is how writers establish their pecking order. In the publishing world, men rule the roost. My voice matters less because I am a woman. While Jessica Fletcher’s gender was not a significant barrier to commercial and critical success, the same is not true in the real world. VIDA, an organization that has tallied bylines and book reviews since 2009, reports significant disparities favoring men’s writing; in top tier publications like The New Yorker, The Atlantic, Harper’s, and The New York Review of Books, male writers outnumber females by two or three to one, both as contributors and as authors of books reviewed. Even when women writers are published, they are “often met with dismissive assumptions,” as writer Anna Clark describes in an essay on women’s literary ambitions. Hess convinces me that the presence of women writers on Twitter is critical not just to our careers, but to our collective survival. Writers I admire seem to have figured this out long ago. I am a longtime fan of author Laura Lippman, whose books treat women and their relationships as worthy subjects for serious crime fiction. But I’m late to discovering Lippman’s Twitter feed, where she makes good on a recent claim that she strives to support women writers because the combination of critical and commercial success is “harder for women to achieve.” In a single week earlier this year, Lippman encouraged a young writer who failed to earn out a large advance; mentioned an essay she was writing about the underrepresentation of female writers and protagonists in the mystery genre’s Edgar Awards; and rallied fellow writers to post cosmetic-free selfies using the #ItsOkKimNovak hashtag in solidarity with actress Kim Novak, who was ridiculed for her appearance at the 86th Academy Awards shortly before Angela Lansbury was honored. Jessica Fletcher would approve of Lippman’s tweets. It occurs to me that Jessica managed to behave as a feminist without raising the hackles of mainstream viewers. She was a single woman of independent means succeeding in a man’s world on her own terms. She refused to be cowed by chauvinistic homicide cops or wily criminals or an arrogant media mogul portrayed by Alan Thicke. Given their similar genres and no-apologies approach to their work, @JessicaBFletcher’s tweets might look a lot like @LauraMLippman’s. With Jessica Fletcher’s presence, Twitter would feel less like a cafeteria and more like an extended family table. J.B. would create order from chaos, smoothing ruffled feathers even while welcoming divergent voices. Like Lippman, she would work to gain women a prominent place at the table. If not a makeup-free selfie, she might post an incredible vacation photo now and then. I don’t know for certain that a modern-day Jessica Fletcher would be on Twitter, but I find myself wishing she were. Kim Kankiewicz is a Seattle-based writer and nonprofit communications consultant. She tweets ambivalently as @kimprobable.